Forget Fortnite and Apex legends! This is FRAG, the French royal battle royale! The Battle Royale world is rich in games but few of them manage to make a place for themselves in the sun. Currently, Apex Legends is the most popular game among users, although Fortnite still manages to bring together a large community of players. Today, it is a French studio that enters the dance: Oh Bibi studio offers FRAG! 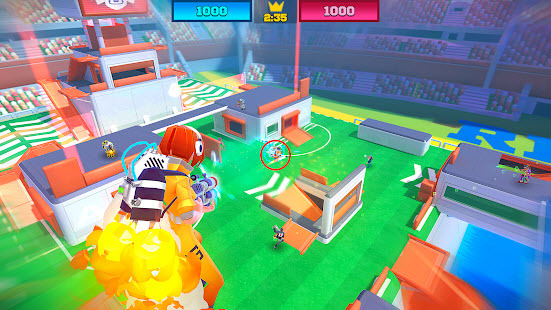 Composed by Gameloft alumni, Oh Bibi studio aims to do better than Epic Games with Fortnite. It's a real challenge but Stanislas Dewavrin, co-founder of Oh Bibi, believes in it: "We started before Fortnite became a success. We were convinced that this would happen. We want to do better than these guys. We always aim for the stars. This is the only challenge we are interested in. FRAG is a colorful and dynamic royal battle where the player controls his character in clashes of a hundred people. Each player can compose a team of several characters (i.e. among about forty) and change them in the middle of a fight to adapt to the situation and the opponents. Each character has his or her own skills and a unique style of play. FRAG is emerging from a beta phase that has greatly improved the player's experience and balanced the characters. The game is already available on Google Play and on the App Store for free download. Leave a comment for	the article Forget Fortnite and Apex legends! This is FRAG, the French royal battle royale!